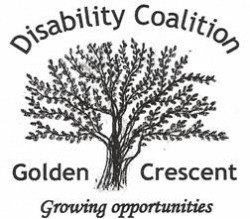 The Disability Coalition of the Golden Crescent was established in April 2008 to aid in the employment of individuals with disabilities. The Disability Coalition seeks to link area employers to an untapped pool of qualified individuals. A collection of agencies and organizations have combined efforts to share knowledge and ideas to help individuals with disabilities and employers become more successful in the workforce. The agencies actively involved in the Disability Coalition work together to provide solutions for employers who are employing and maintaining the employment of individuals with disabilities. Various agencies within the Disability Coalition assist individuals with disabilities fine tune hard and soft skills needed in today's workforce.